January 20, 2019 By // by Frugal Patti 1 Comment This post may contain affiliate links. This means I make a small commission if you make a purchase, at no additional cost to you. See my disclosure for more information. As each year rolls around many people will identify one or more New Year’s resolutions. We want to better ourselves and move forward in a positive direction. When January 1st comes around, it feels like a fresh start and time to turn over a new leaf. The most popular resolutions each year are losing weight, exercising more and to stop smoking. It doesn’t take long before we get back into our old habits and our resolutions have gone by the wayside. You may have already given up on those goals you wanted to accomplish this year, if so you’re not alone. Actually, 80% give up on those resolutions by the 2nd week of February. When setting my annual goals, I typically identify goals in a few different categories (financial, health & fitness, household, personal development, work & career) and concentrate on one primary goal in each category. To be the most productive and successful, make sure you’re not working on too many or complex goals (you may need to break some of the complex goals into sub-goals or tasks. There is no reason to set a goal or set of goals that you know you won’t be able to accomplish. 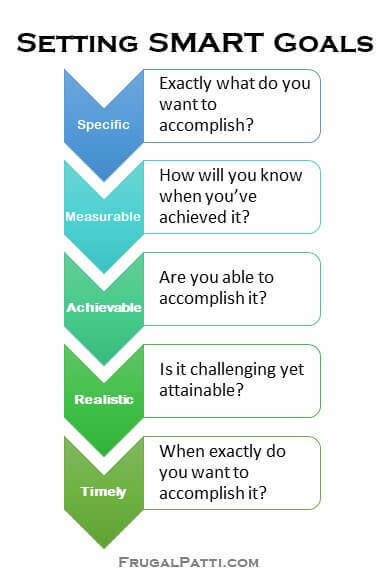 To help you create goals that will really assist you in accomplishing more, here are five criteria that will help you document your goals. SMART (Specific, Measurable, Achievable, Relevant, Timely) is an acronym that will assist in your goal development. Specific – Each of your goals should be as specific as possible. If you want to work on your home, be specific about what you would like to accomplish. Do you want to paint? What room or rooms? Do you need to purchase new furniture? What specific pieces do you need to replace and for what room? The more detail that you add to documenting your goals the better it will be. Measurable – Each goal will also need to be measurable. How will you measure if you have attained your goal? If your goal is to lose weight, how will you measure that? Is 1 pound a success or is it 10 pounds that you really want to lose? Achievable – Make sure each of your goals are achievable. There is no reason to “bite off more than you can chew” or set yourself up for failure. If you’ve never exercised, or it’s been a while, start by setting smaller goals that you will be able to attain. If you’re just returning to running, for instance, consider completing a 5K for this year’s goal and save that marathon for a future year’s goal. Successfully completing a smaller goal will give you confidence to keep going, and you’ll be able to set more advanced goals in that category for many years to come. Relevant – The goals must also be relevant to you. Is it important to you and what you want to accomplish in your life? If your goal won’t make an important change in your life, maybe it’s not really a goal you should spend your time and energy on. If you’re planning to learn a new language, to dance, to cook a new cuisine or to work on your car; is this goal import to you and will it change your life for the better? If you’re just as happy taking your car to a garage, then maybe learning how to work on your own car isn’t the best goal for you to spend your time on. There are plenty of other goals to consider that will matter to you. Timely – What time-frame do you want to complete your goal in? Do you want to lose those 5 pounds by the end of January or by the end of the year? Without setting a time-frame for each goal, there is no way to know when you’ve successfully completed it! Break down complex goals – If your goal is complex, consider breaking it down into tasks or smaller goals. Instead of concentrating on losing 25 pounds, focus on losing the first 5 pounds. Once you’ve lost the first 5 pounds, you will know what worked for you and have the confidence to work on the next 5 pounds. Document tools or process to accomplish goals – What do you plan to do specifically to ensure you accomplish each goal? For our lose 5 pounds example, some possible ways to track all food and exercise in the Lose It app and/or add an additional day of exercise per week. By documenting not only the goal, but also the process to get you there, you can later analyze what worked and what didn’t, and modify your process as needed. Regularly check-in on your progress – Regularly check in on your goals and the progress you’ve made on them. Are you on track to accomplish all your goals? Do you need to change anything to ensure your success? I like to make this progress check-in at least monthly. Revise goals or process – As you make your check-in, identify any changes or modifications that need to be made to either your goals or the process your are following to attain them. As some time passes, you may have gained knowledge or more detail on what you need to do to attain your goal. At this point, document any modifications you feel are necessary. Get help if needed – Reach out for any help you may need to reach your goal. If you need help staying on track, reach out and get the help you need. Find a supportive training partner. Find a book or Facebook Group to help you reach your goals. What goals have you set to accomplish in 2019? What steps are you taking to ensure your success? January 8, 2013 By // by Frugal Patti 6 Comments This post may contain affiliate links. This means I make a small commission if you make a purchase, at no additional cost to you. See my disclosure for more information. As we come to the end of 2012, it’s time to reflect on what we accomplished (or didn’t accomplish) and what we could have done differently. In this process, please don’t beat yourself up over the miss-steps made, but just identify and learn from them. Maybe you wanted to save $50 or $100 each month last year and weren’t successful at it. Why not? You will need to analyze those things that didn’t go just right, or you just may end up making those mistakes again. I had one of these learning experiences recently. While trying to balance work and family responsibilities; along with a week-long business trip with my husband in December, some Christmas activities were put off a bit too much. In the week and a half between our trip and Christmas Day, I completed all Christmas gift shopping, decorating and cooking. Unfortunately, I didn’t pay close enough attention to the dates I needed to ship gifts out of state before the prices were outrageous. My brother and his family recently moved and I just wasn’t used to this shipment as one of my holiday duties. I’m usually a person that plans far ahead and finishes holiday tasks early, to make the most out of the Christmas season with family and friends. This experience really taught me a lesson. It was a mistake I won’t make again! With this analysis complete, we’re ready to head into 2013 by setting goal to help us prevent past mistakes, creating new and healthy habits. I typically set goals in a few different categories (finance, fitness, household, education, etc.) and concentrate on one primary goal in each category. To be the most productive and successful, make sure you’re not working on too many or complex goals. There is no reason to set a goal or set of goals that you know you won’t be able to accomplish. To help you create goals that will really assist you in accomplishing more, here are five criteria that will help you document your 2013 goals. SMART (Specific, Measurable, Achievable, Relevant, Timely) is an acronym that will assist in your goal development. Each of your goals should be as specific as possible. If you want to work on your home, be specific about what you would like to accomplish. Do you want to paint? What room or rooms? Do you need to purchase new furniture? What specific pieces do you need to replace and for what room? The more detail that you add to documenting your goals the better it will be. Each goal will also need to be measurable. How will you measure if you have attained your goal? If your goal is to lose weight, how will you measure that? Is 1 pound a success or is it 10 pounds that you really want to lose? Make sure each of your goals are achievable. There is no reason to “bite off more than you can chew” or set yourself up for failure. If you’ve never exercised, or it’s been a while, start by setting smaller goals that you will be able to attain. If you’re just returning to running, for instance, consider completing a 5K for this year’s goal and save that marathon for a future year’s goal. Successfully completing a smaller goal will give you confidence to keep going, and you’ll be able to set more advanced goals in that category for many years to come. The goals must also be relevant to you. Is it important to you and what you want to accomplish in your life? If your goal won’t make an important change in your life, maybe it’s not really a goal you should spend your time and energy on. If you’re planning to learn a new language, to dance, to cook a new cuisine or to work on your car; is this goal import to you and will it change your life for the better? If you’re just as happy taking your car to a garage, then maybe learning how to work on your own car isn’t the best goal for you to spend your time on. There are plenty of other goals to consider that will matter to you. What timeframe do you want to complete your goal in? Do you want to lose those 5 pounds by the end of January or by the end of the year? Without setting a timeframe for each goal, there is no way to know when you’ve successfully completed it! • Walk 1000 miles by the end of the year. • Complete 1 strength training workout per week. • Paint the family room, kitchen and hallway by the end of the year. • Complete a personal finance course by the end of January. This one I’m very excited about and will write a post on in the near future. 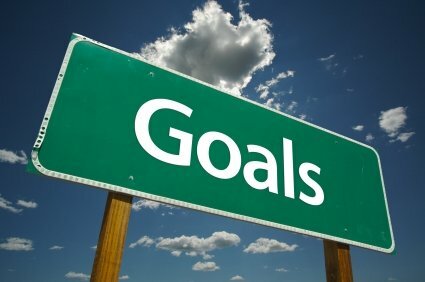 What are the most important goals that you will set to complete in 2013?